Classic and elegant. Investment grade quality and a lifetime of enjoyment - only offered by Japanese Akoya Cultured Pearls - grown in the cold waters off the coast of Japan where the cold water slows down the growing process - resulting in shine and luster that cannot be duplicated. All of our Akoya cultured pearls are certified by the Japan Pearl Exporters Association to ensure the strictest of standards. 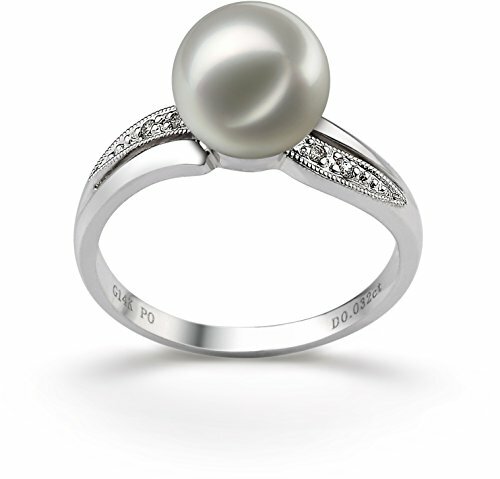 This exquisite ring showcases one white Japanese Akoya 7 to 8mm cultured pearl. The cultured pearl is an overall AAA quality - combining breathtaking mirror-like AAAA luster, perfect (and very rare) AAA shape and AAA body. Four sparkling diamonds, a total gem weight of 0.03ct, accent this 14K white gold ring. Your ring will be carefully packed and shipped to you in an elegant velvet lined box and accompanied by lots of free extras. And, if you choose, we would be delighted to gift wrap your ring and turn this ring into an unforgettable gift.